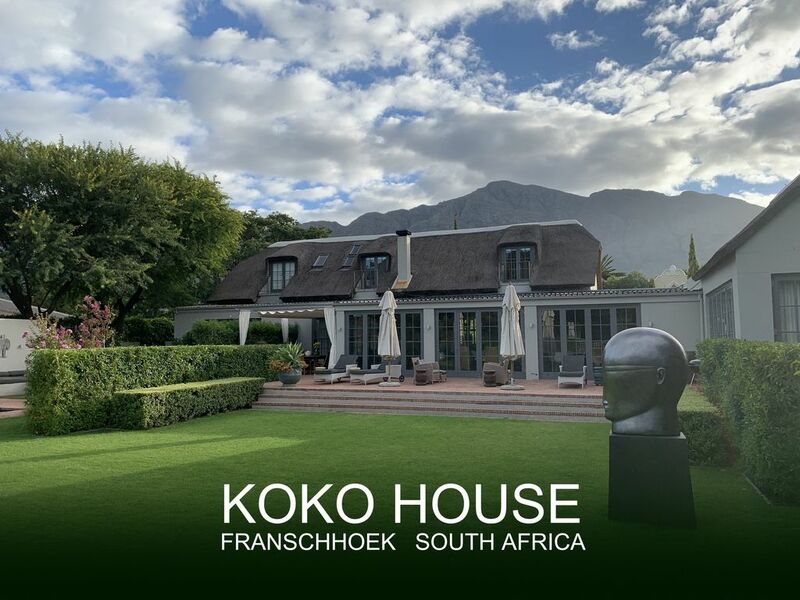 KoKo House est une superbe maison privée située dans une rue résidentielle calme du centre de Franschhoek, à deux minutes à pied du centre du village et de ses restaurants, galeries et magasins primés. L'utilisation exclusive de notre maison est offerte sur une base autonome, et est une retraite idéale pour une famille ou des amis, et une base idéale pour explorer les magnifiques vignobles. Le Cap est à une heure en voiture. ★ Des séjours de 1 ou 2 nuits sont possibles moyennant un supplément. Pour les longs séjours, nous sommes heureux de proposer des tarifs réduits. Offrant une vue sur la montagne, la maison est située dans de grands jardins isolés conçus par Franchesca Watson. La maison peut accueillir 10 personnes confortablement dans 4 suites doubles indépendantes et climatisées (la grande suite sud dispose de 2 lits doubles), avec la possibilité d'en dormir deux autres (12 au total si nécessaire) à l'aide de l'étude (avec un salle de douche et WC) en tant que chambre supplémentaire - pour plus de détails, veuillez consulter le plan de la propriété • Salon avec cour extérieure • Cuisine • Salle à manger • Salle de télévision • Bureau • Petite terrasse • Terrasse extérieure • Salle à manger en plein air • Piscine d'eau salée de 12 m située dans un grand jardin clos • Entretien ménager • Wi-Fi • Parking en garage • Remises proposées - contactez directement kokohousefranschhoek. com. Des courts séjours de 1 ou 2 nuits sont possibles moyennant des frais supplémentaires. Veuillez nous envoyer un message. We were four couples traveling to the winelands for 4 nights. KoKo House surpassed all of our expectations. It is a gorgeous and well-maintained villa just one street away from Franschhoek's main road--shops, galleries, restaurants. It's worth visiting this villa for the art alone (not to mention the pool and back yard mountain view)! The kitchen was fully-equipped and the daily maid service appreciated. The owner was very responsive (as was the house manager), to include providing valuable information about local restaurants, many of the best within walking distance (Reuben's, Foliage). We were all blown away by the property and highly recommend it. A wonderful place to stay!!! We all loved Koko house! The house is beautiful and located in the center of the village; the rooms were spacious, clean, sunny, with all the modern accessories; the kitchen was especially large and well equipped, with room for 13 around the dining room table; the outside space was perfect, both for the morning and afternoon sun; the art was exceptionally wonderful (!) and added elegance to the whole house. We all loved hanging out at Koko House and would highly recommend it to others! Thanks to the owners for giving us the opportunity to enjoy their wonderful home! We loved this spacious home with its spectacular setting. Our rental was run smoothly and the location is within driving distance of many of the Cape’s sight seeing spots. Our expectations for KoKo house were pretty high but we were absolutely delighted and excited on arrival at the prospect of staying in this amazing house. It was warm and welcoming and grand! Several rooms lead to the outside, either a private courtyard with its own water feature or to the magnificent gardens and spectacular pool. Two of the ground floor bedrooms opened out directly to the garden, one directly to the pool and garden. We felt like film stars staying there. If you haven't been to Franschhoek, then you haven't lived. From the house to the high street took two minutes and there we were surrounded by wonderful restaurants, and lots of shops and galleries, and the whole of the wine valley. After a day of shopping and dining, going back to the house just ensured that our wonderful day continued. The bedroom suites in the house were equally grand, comfortable and clean, in fact the whole house was very well kept. We felt spoilt and we can't wait to go back again next year. We would highly recommend it to our friends and family. Lovely property but very disappointed to have money deducted from our deposit for damage we are certain we did not do. It leaves a very sour taste. A memorable holiday in an exceptional thatched property set in a quiet location within a short walking distance of Franschhoek's shops, excellent restaurants and art galleries. KoKo House is immaculate inside and out and is tastefully decorated to a very high standard with local art adorning the walls. It offers very comfortable en suite bedrooms. The lounge areas are spacious and comfortable. it is ideally suited and equipped for both small and larger groups. Outside is a good sized pool set in lovely gardens with several areas for relaxing on loungers etc. Not far away are numerous wonderful wine estates and, for those that wish to travel further afield, Cape Town and Hermanus are within easy reach. I will definitely be back. Niché entre de magnifiques montagnes, Franschhoek est célèbre pour abriter certains des plus beaux vignobles d'Afrique du Sud, ainsi que pour ses restaurants de classe mondiale. Koko House est située dans une rue calme à proximité du village, à 2 minutes à pied de la route principale où se trouvent de nombreux restaurants, galeries et magasins. Le village est facile et sûr, avec un style très décontracté. Nous vous recommandons de réserver vos restaurants à l'avance et de vous conseiller sur les endroits où manger. Le tram à vin est très populaire auprès des clients et se trouve à 2 minutes à pied. PLEASE ENQUIRE (kokohousefranschhoek . com ) FOR DISCOUNTS ON LONGER STAYS ● Full terms and conditions on request or listed on kokohousefranschhoek . com. Terms & conditions will be mailed at time of booking ● Booking only confirmed once 50% deposit has been paid, and contract with terms and conditions signed and returned. ● We require full contact information related to the booking, including South African ID number or Passport number, contact address, email and phone numbers. ●Check in/out times Unless agreed otherwise, Check in is after 14.00hrs on day of arrival. Check out is before 10.00hrs on day of departure. ●Occupancy It is agreed that the property shall not be occupied by more than the number of persons agreed at the time of booking. No parties or events allowed. ●Domestic Services This property is self catering. The cleaning of bedroom suites & living areas is included Monday – Friday. The Housekeeper will service all suites and living areas each day, Monday - Friday. The Gardener will keep the outside areas swept and tidy each day, Monday - Friday. Bed linen will be changed weekly. Personal laundry services are not included. If Guests require personal laundry services, or additional housekeeping at weekends, please inform the Property Manager to arrange. There will be an additional charge, and this should be settled with the Property Manager prior to departure. ●Electricity Electricity is included in the cost of your stay. If however guests us excessive amounts of electricity there will be an extra charge for the additional units used. ● Damages deposit required. ●Security Property has a 24hr response alarm fitted. 2 x small safes for guests' use.